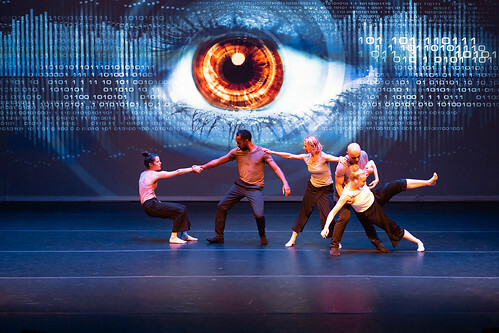 “Dancing with the Future” is the latest IIASA production that pushes the boundaries of art and science, fusing dance, evolutionary dynamics, and an interactive game. The International Institute for Applied Systems Analysis (IIASA) and the Program for Evolutionary Dynamics (PED) of Harvard University, USA, are collaborating on this interdisciplinary project. “Dancing with the Future” will premiere at Harvard University’s Farkas Hall on 25 September 2018 and will subsequently be presented at the International Conference on Sustainable Development, during the United Nations General Assembly, on 27 September in New York. The New York performance will be live streamed and is generously supported by the Austrian Cultural Forum New York. In this production, five dancers and two scientists explore the mechanisms of cooperation and investigate a question that is at the heart of all sustainable development, yet remains widely elusive because it entails a moral component that cannot easily be assessed: are humans able to cooperate with future generations? In other words, what kind of planet are we willing to leave behind for the people who come after us? Tickets for the premiere can be purchased through the Harvard Box Office. Gloria Benedikt was born in Austria and trained at the Vienna State Opera Ballet School and English National Ballet School (London). Since 2002 she has worked as a dancer and choreographer across Europe and the USA. A graduate of Harvard University (2013), she is particularly interested in connecting art and science, thus defining her dance pieces as choreographed papers and in creating artistically innovative, impact-driven arts projects that link the humanities and sciences to solve global challenges. In 2015 she became the first Research Associate for Science and Arts at the International Institute for Applied Systems Analysis (IIASA), since 2018 she leads the Science and Art Project. She is explores how artistic and scientific processes can be connected to tackle global challenges more effectively and support transformations to sustainability. Recent performance and speaking engagements include the Kennedy Center, Washington DC; Carnegie Hall, the House of the European Union, Vienna; the European Culture Forum, Brussels; the European Forum, Alpbach; the Bridging Europe Festival, Budapest; the European Commission’s Joint Research Center, Ispra; the Forum on European Culture, Amsterdam; the Stockholm Act and ESOF 2018. She co-curated the UN Concert for a Sustainable Planet 2017. Hannah Kickert was born in Austria and trained at the Vienna State Opera Ballet School for nine years. Immediately after graduating with honors (2014) she started working as a corps de ballet member at the Vienna State Opera. Over the course of three years dancing at the well renown ballet company, she had the chance to participate in various choreographies of Nurejew, Balanchine, Robbins, Ekman, etc..
Due to multiple interests she started studying Political Science at the university of Vienna and proceeds to study at Fernuniversität Hagen. Being a scholarship holder of the European Forum Alpbach 2016 she got in touch with Gloria Benedikt and participated in her next piece InDilemma performing at the EFA 2017 and at the OSCE Ministerial Council of the former Principal Imperial Palace. She then proceeded to study dance in New York with teachers such as Wilhelm Burmann and Marijke Eliasberg, whilst performing at the Viennese Opera Ball in New York or at UNI, a dance event celebrating and showcasing Haitian arts and culture. In future endeavors she would like to combine politics with dance. Piotr Magnuszewski works on the question of what makes things complex and how to understand and manage this complexity. He has been working for decades as a systems modeler, game designer, professional trainer, facilitator and researcher to provide tools for people in all sectors to make better policies and decisions about the society and environment. He designed and applied many social simulations and role-playing games addressing the issues of resilience and sustainability such as climate change, energy transition, management of natural resources. The tools the designed and applied enable more effective collaboration for groups and organizations. Piotr has been working with diverse groups of scientists, businesses, NGOs and international organizations including the European Commission, OECD, African Development Bank and the Zambezi Watercourse Commission. Piotr works as a research scholar at the International Institute for Applied Systems Analysis (Austria). He is also co-founder and managing director of the Centre for Systems Solutions (Poland). He is an author of many research and educational publications. Mimmo Miccolis, born in Italy, is a contemporary teacher and choreographer at The Washington Ballet. He was the winner of the “Outstanding Choreographer Award” at the Youth American Grand Prix (YAGP) Finals 2015 in New York City and at the Indianapolis International Ballet Competition 2017. In 2011, he was also a recipient of the BBC Performing Arts Fund in London, UK. Most of Mimmo’s choreographic work focuses on social issues and have been performed in venues such as the World Bank, the Inter-American Development Bank, the Smithsonian American Art Museum and the Kennedy Center in Washington DC, the Carnegie Hall in New York, the Organization for Security and Cooperation in Europe (OSCE), the European Forum and the House of the European Union in Austria, at the EuroScience Open Forum 2018 Toulouse in France and the European Commission Joint Research Center in Italy. Mimmo’s work incorporates elements from his background in dance, opera, TV, cinema and dance illusion. Martin A. Nowak is Professor of Mathematics and of Biology at Harvard University and Director of the Program for Evolutionary Dynamics. He works on the mathematical description of evolutionary processes, including evolution of cooperation and human language, as well as dynamics of virus infections and human cancer. An Austrian by birth, he studied biochemistry and mathematics at the University of Vienna where he received his Ph.D. sub auspiciis praesidentis. He went to the University of Oxford as an Erwin Schrödinger Scholar and worked there with Robert May, with whom he co-authored numerous articles and his first book, "Virus Dynamics" (2000). Nowak became head of the mathematical biology group in 1995 and Professor of Mathematical Biology in 1997. A year later, he moved to Princeton to establish the first program of theoretical biology at the Institute for Advanced Study. He moved to Harvard University in 2003. Nowak is a member of the Austrian Academy of Sciences, the recipient of the Weldon Memorial Prize, the David Starr Jordan Prize, and the Akira Okubo Prize. He is author of over 475 papers and four books. "Evolutionary Dynamics" (2006) provides an overview of the laws that govern the evolution of living systems. "SuperCooperators" (2011) argues that cooperation is the third fundamental principle of evolution. Henoch Spinola, a native of Cape Verde Islands, began his classical training with Jose Mateo’s Ballet Theatre, graduating from the Young Dancers Program in 2006 to become a full company member 2007. After leaving JMBT, Henoch began working with Prometheus Dance from 2011–2012, along with other dance companies local to Boston. He then moved to New York City to dance in a work by Itzik Galili at the Metropolitan Opera from 2013-2014. He recently completed the Master of Fine Arts program within the Creative Practice: Dance Professional Practice Pathway at Trinity Laban Conservatoire of Music and Dance in London. Jessie Jeanne Stinnett holds a BFA in Dance Performance from The Boston Conservatory and an MFA in Creative Practice: Dance Professional Pathway from Trinity Laban Conservatoire, in conjunction with Independent Dance/Siobhan Davies Dance. She has performed for the Metropolitan Opera, Tate Britain, Prometheus Dance, Anna Myer and Dancers, Rebecca Rice, The Boston Baroque Opera, Bard College’s SummerScape Festival, and Boston Dance Theater; most notably in works by Itzik Galili, Pablo Bronstein, Marjorie Folkman, Sidra Bell, and Gigi Caciuleanu. Jessie’s choreographic work has been described by Hannah Chanatry of WBUR as “conceptually driven performance that unpacks the complexities of being female, and pushes the academic boundaries of choreography.” Her recent choreographic commissions include Keene State College, Providence College, Emmanuel Music, and The Purcell Society of Boston. Jessie's work as a choreographer and also as co-artistic director of Boston Dance Theater has been sustained in part by grants from The Boston Foundation with support from The Barr Foundation, New England Foundation for the Arts, Live Arts Boston, New England States Touring Grant, New England Dance Fund, Assets4Artists, Boston Cultural Council, Massachusetts Cultural Council, Boston Mayor’s Office, and Fidelity Charitable donor-advised fund.